Writing in one of the custom fonts will add appeal to him. And in some cases its use can serve as a method of text styling, as exemplified by Gothic font. First need to find and install the appropriate Gothic font to work with it. Search on the Internet on websites (for example, xfont.ru, ifont.ru etc.) or by using search services (Yandex, Google, Rambler, etc.). 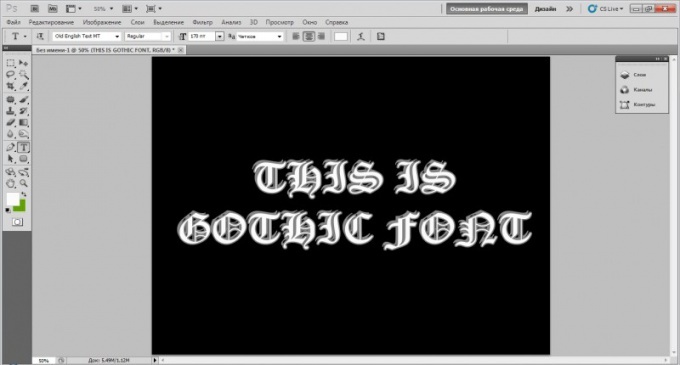 Finding the right Gothic font, download it to PC hard disk. If it is in the archive (rar, zip, etc), remove it. After that, you will need to install the font in the system. There are two ways by which you can install the required font. Double click on the downloaded font file. A window will open which will show the name and a sample text of different sizes. Click located in the upper part of the window, the "Install" button. Wait until the end of the process. At the end of the font will be installed. The second installation option is as follows. Open the Explorer folder of Windows operating system located on the system local disk. Locate and open the Fonts directory. Copy the file you have downloaded Gothic font. To do this, simply drag it with the mouse to this folder, or click the right button on mouse, select "Copy", then click the right mouse button in the Fonts folder and select "Paste". Wait for the file copy. Open the program in which you want to create the inscription in Gothic font. This can be a text editor, such as Microsoft Word or graphics – Microsoft Paint, Adobe Photoshop etc. Under "Font" select the installed font. Now start writing the text – it will be executed Gothic font. Also you can first just write the text, then select it and under "Font" to select. The entered text will be presented in the Gothic style.